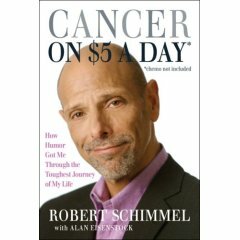 Robert Schimmel was a successful comedian in 2000, with an HBO special, a TV sitcom in the works, and the title of "Stand-up Comic of the Year". As anyone who has been touched by cancer knows, cancer isn’t concerned with such success. Robert was diagnosed with an aggressive non-Hodgkin’s lymphoma that year, and all of this success was quickly put into perspective. Schimmel’s humor may be a bit risqué for some, but it is primarily what gets him through the grueling 8 months of treatment. Using this humor, he tells his story, which is funny, heart warming, courageous and inspiring. Like many cancer survivors, life changes for Robert and life’s priorities are suddenly realigned. Some may say, how can he joke about this disease? But, it is his humor that supports him and his newfound friends in the cancer support group through their experience. Robert’s story will make you laugh and cry, but most of all, if you have been through your own cancer journey, you will smile and shake your head in agreement. Cancer changes you and reading the author’s story reminds you of what you have been through, how survivorship and love may be your new definition of success, and that humor can go a long way when dealing with cancer.